Marathon & Beyond contributor Ray Charbonneau is the editor of The 27th Mile, a new anthology of articles, stories, and poems about running and runners: http://the27th mile.com. The book is $12.99 for the paperback and $4.99 for the e-book. 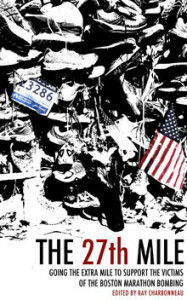 ALL proceeds from sales of The 27th Mile will go to The One Fund Boston to support the victims of the Boston Marathon bombing. The 27th Mile includes a mix of fiction and non-fiction contributed by a wide range of talented writers who run. They’re marathon champions and weekend warriors, ultramarathon racers and fitness joggers, running magazine pros and bloggers, bestselling novelists and indie publishing standouts, people like Joe Henderson, Amby Burfoot, Ben Tanzer, Kathrine Switzer, and Lawrence Block. 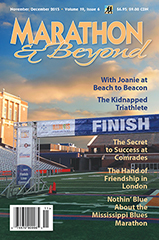 Within the book, you’ll find stories that extol the spirit that first got us out on the roads to run, that brought us to Boston on a sunny spring day, and that will bring us back to Hopkinton next year, and in the years that follow. It’s the spirit we celebrate every time we go for a run, whatever the distance. It’s a great book for everyone who, even as they eat dinner with their family, put in another eight hours at work, or sit and read the book, have already planned when they’ll go out for their next run. Get your copy today!